15:30 Sarah St. John of Sanctuary Health talks about the campaign to stop Fraser Health Authority informing CBSA about people needing health care. 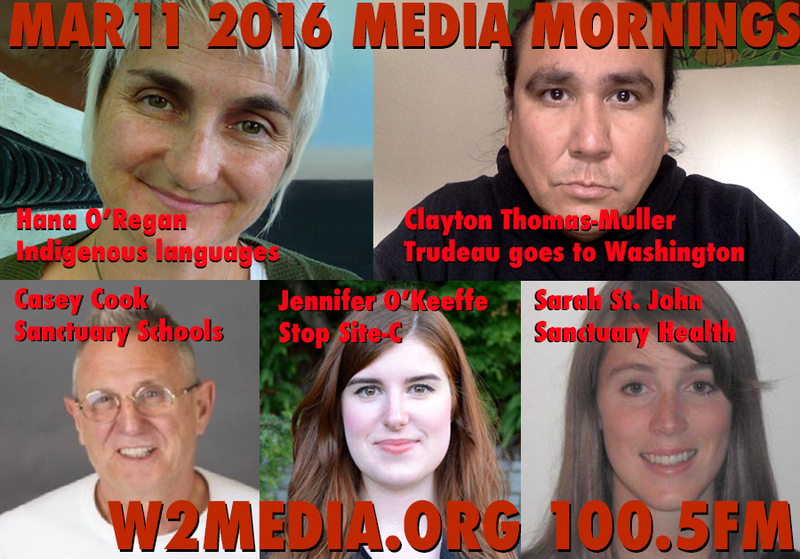 24:50 Are Sanctuary Schools possible for New Westminster? Let’s see what School Trustee Casey Cook is exploring. 32:45 Clayton Thomas-Muller tells us what Trudeau was wearing at the Washington State Dinner NOT – and if it made any difference to the climate crisis. Clayton breaks down recent examples of doublespeak on climate change and business-as-usual. 45:00 Hana O’Regan, Maori educator, language activist, and proud mother comes from Aotearoa (New Zealand) for a soldout Kwi Awt Stelmexw event tonight. 55:00 Jennifer O’Keeffe is going to get our weekend set with details on a Site-C rally on Sunday.